My family consumes a lot of sushi, so everyone is thrilled when I have seared tuna on the menu at our house. It is the quickest main dish to prepare if you, like my children, enjoy fresh tuna pretty raw; it cooks in minutes. The olive and caper relish has strong flavors, so I often serve it on the side. SPRINKLE both sides of the tuna steaks with the basil, thyme, and pepper to taste. Heat a large frying pan over high heat (do not add any oil). When the pan is hot, add the tuna steaks and cook for 1 to 1 1/2 minutes on each side, just long enough to sear the outside. Leave the center raw, unless you prefer tuna cooked all the way through. REMOVE the tuna steaks to a plate. Reduce the heat to medium and add the oil. Add the red onion and garlic and cook for 2 minutes, stirring often. Add the capers, olives, sugar, and pepper to taste and cook for 1 minute. Remove the pan from the heat. 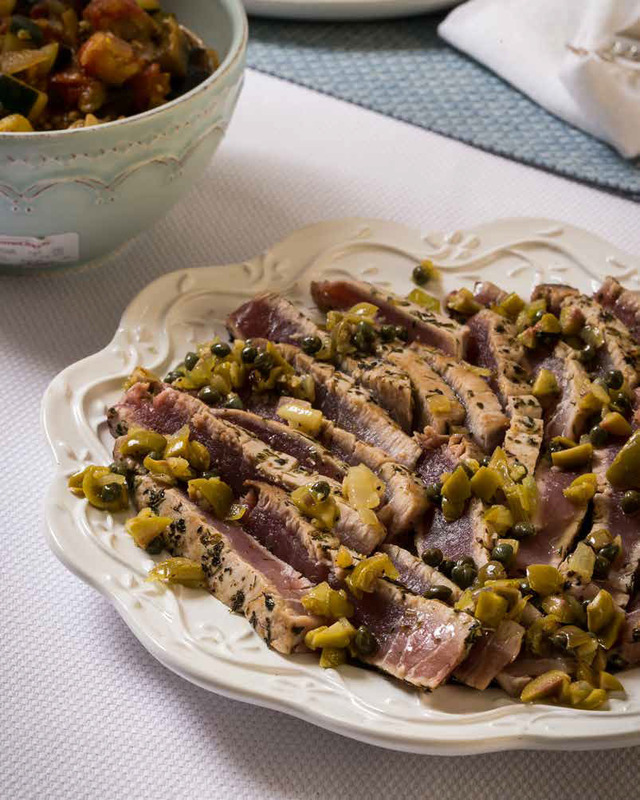 PLACE the tuna steaks on a cutting board and slice into 1/3- to 1/2-inch-thick (8- to 12-mm) slices.Place the slices on a platter and sprinkle the caper and olive mixture on top, or serve it alongside in a small bowl.